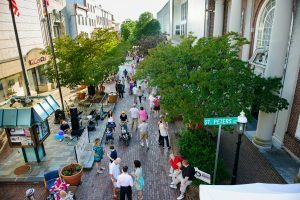 From a truly unique and delicious dining experience to attending the next 3rd Friday with your family- Salisbury has many things for you to see, hear, taste, touch and experience! We’ve gathered them below and encourage you to explore the Capital of the Eastern Shore! Did we miss something great? Let us know! Submit your “SBY Thing to do” here. BikeSBY: BikeSby was established in 2012 by a group of like-minded friends to form the first bike lane network in Salisbury, MD. Since that time, we have come to adopt and implement not only bike lanes throughout our City, but a Bike Master Plan. We are investing in a Bike Share program and are committed to Salisbury’s bike-ability. Check out BikeSBY to learn more! Eastern Shore Running Club: The Eastern Shore Running Club (ESRC) was founded in 1999 in Salisbury, Maryland, as a non-profit organization to promote running and walking as a means to a healthier lifestyle. A Road Runners Club of America member organization, ESRC promotes and builds the running community on the Shore through service and advocacy. The club provides finish line support services to several civic and nonprofit organizations. ESRC provides weekly, skill-level specific running outings. The details can be found here. Naylor Mill Forest: Naylor Mill Forest Trails (formerly Naylor Mill Park) was established through funding from Maryland’s Program Open Space and the City of Salisbury. Find out more about all of our Parks and Open Spaces through our Parks & Rec Committee, found here. We have such a creative and talented community; we like to showcase that talent every chance we get. Below are some of our local creative organizations! Downtown Arts & Entertainment District: The hub of everything creative happening in Downtown Salisbury, the Downtown Arts & Entertainment District coordinates and manages 3rd Fridays, 1st Saturdays, Fridays at 5, The Downtown Salisbury Festival, New Years Eve SBY and many other community events integral to our community identity. Salisbury Art Space: A true community gallery with a passion for sharing the arts throughout the Salisbury community in an educational and inspirational way, the mission of Salisbury Art Space is to enhance the visual arts in the Mid-Delmarva region through art education and exhibition opportunities for all. There is always something going on at the gallery, check out what classes are open and who’s show is happening here. Live Music all over town! Most any night of the week you can hear live, local music in the air Downtown. Sign up for the Downtown SBY newsletter to be ‘in the know’ for the local music scene! AMP Studios- Academy of Music Performance: Right in the heart of Downtown, there lives an amazing organization that fosters and empowers student musicians. Playing throughout the community for public events and community organizations, they are the future of music in and around Salisbury. Salisbury Community Band: A community tradition full of talent, the Salisbury community Band plays for the community for free during the summer months. Located in the bandstand at City Park, it is a Sunday activity not to miss! Community Players of Salisbury: Bringing live local theater to life for decades, the Community Players of Salisbury regularly produce four shows within the season; a major musical and three additional shows.